The Crawford Fund recently offered one of our young scholars, Sarah van Bronswijk, an opportunity to attend the 2015 Australasian Aid Conference. Sarah’s report follows. The Crawford Fund attended the 2015 Australasian Aid Conference on 12-13 February in Canberra. 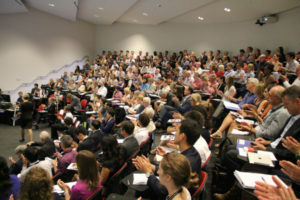 Jointly hosted by the Development Policy Centre and the Asia Foundation, the Conference was held at the Crawford School of Public Policy in the College of Asia and the Pacific at the Australian National University. 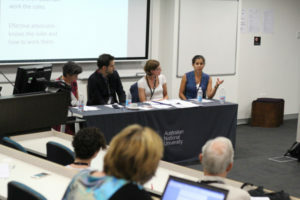 Bringing together researchers and practitioners in the aid and development sector in the Asia-Pacific region, the Conference focused on current issues in aid and the future of development. For two days it was a room full of people passionate about development and improving the efficacy of aid in our region. The program reflected the dynamic nature of international research and development. Topics ranged from the role of the private sector, health and transitional justice, to the rise of aid from Asia and the future landscape of aid and development. The calibre of the speakers was a highlight: from CSIRO and ACIAR to the World Bank and Chinese Ministry of Finance. It was exciting to see exceptional researchers who are passionate about the role of international development, and eye-opening to hear of research from such a wide range of areas. Some of this eye-opening research included work co-authored by ACIAR’s John Dixon and Andrew Alford et al., on improving aid effectiveness in agricultural food systems, Getting to impact: enriching Logframes with Theories of Change. A special part of the conference was the opportunity to hear some perspectives that are not always given a platform: views from country-recipients of aid. Policymakers and researchers from Timor Leste, Cambodia and Laos spoke passionately about the local impacts of aid, and development policy challenges facing recipient countries. While challenges in development emerge, the Crawford Fund and others like it will continue to mobilise support for international development research. Overall, the 2015 Australasian Aid Conference demonstrated that researchers and policymakers in development are not remaining idle in the wake of a changing aid landscape.